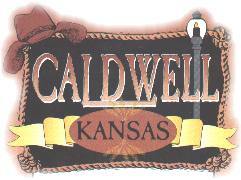 One of only six cowtowns in Kansas, Caldwell was founded in 1871 astride the then new Chisholm Trail as an economic adventure of a group of Wichita entrepreneurs. The trail, running from Texas to the Intercontinental Railroad in northern Kansas, guided over a million longhorn steers and their guardian cowboys through Caldwell. Business people from afar made their home here to ply their trades, whatever they be, from banker toliquor dealer to prostitute. Incorporated in 1879 when the railroad neared the city limits, Caldwell boasted a longer cowtown period (1880-1885), a higher murder rate, and loss of more law enforcement officers than other, even more famous, towns such as Dodge City, Abilene, and Wichita. Fame, however, is not definitive of history. From the past come the true stories of Cowtown Caldwell - the hanging of the city's first lawyer for horse stealing, the unfortunate robbing of a nearby town bank and the killing of its president by a well-liked Caldwell City Marshal, the murder of another City Marshal by the town's police force, an outlaw brought to justice for a murder following a shootout where the outlaw was shot thirteen times but lived to see his trial date... and the list goes on and on. History lives on here... A life-sized silhouette of a trail cattle drive, historical markers everywhere you turn telling the cowtown stories, boot hill cemetery with its re-enactors and "talking tombstones," and the celebrations that bring history to life and knowledge of the past to children today. The Caldwell Carnegie Library was one of 59 public libraries constructed in Kansas. Built in 1912, it is listed on the National Register of Historic Buildings. The Santa Fe Railroad was the first railroad that came into Caldwell. Traces of the pens are still visible as well as the roundhouse. Caldwell, the Border Queen, has seen wild days as a cowtown beside the Chisholm trail, a brief period of booming times during the Oklahoma Land Rush days, and quiet prosperity based on the vast grain fields of Sumner County. St. Martin's Catholic church was built in 1924 in the style of old Spanish Missions. It's a beautiful old stucco and terra-cotta building with the mural "King of Kings and Lord of Lords" inside.